Occasionally, I like to take a glance at our Dakno client’s new real estate websites just to see how they are coming along. It’s exciting to see our clients creating unlimited web pages with their Agent Backdoor site editor, uploading neighborhood pages and adding high-value content to their sites. I have decided to offer a few tips based on some observations I commonly see once a client begins to “grow” their Dakno website. Often, a client will create a new web page and forget to add keywords to the title tag, meta tag and meta keywords for the page. Here is an example of such a page. When creating new pages don’t forget to always add a geographic keyword reference to your content and to your headlines for superior organic search engine optimization too. In this example I recommended the agent add a smidgen of copy at the top of this page to help with SEO. I also encouraged this client to add a wee bit more information for each golf course, like is it private or public, number of holes, length of the tract, etc. Now you’re offering real value to your site visitor. Isn’t that what it’s all about? Let’s face it, the easiest way to add content to a website is to create a link resource page. I’m not a big fan of this strategy for a couple of reasons. You paid hard earned money to build a real estate website to have people visit it and maybe even encourage them to connect with you. So why in the world are we so eager to send our traffic away providing links to everywhere? 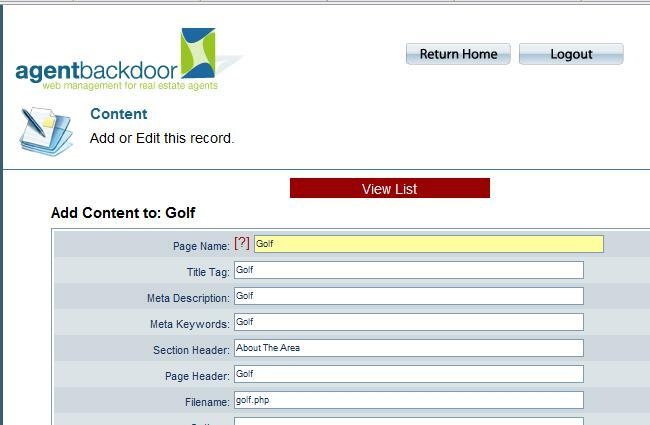 Why not write a bit of copy about every one of those golf courses and keep your site visitors to your self. So my question to you is this, are you creating a leaky website by offering a resource center for links? In a future post I’ll recommend even more tips to help your real estate website offer greater value so it is seen as the rich resource worthy of many return visitors. Can you give an example of one that is fully optimized? Is this site a swift web site or custom? The example used is a SwiftSite that has some additional design customization beyond the standard $549 set up. That customization includes the “Featured Properties graphic”, the “Market MLS Snapshot”, the guided navigation graphic for “Jenn’s Blog” and the java script driven images in the header. Regarding your question about an example of a SwiftSite that is optimized, I would have to say http://www.montclairrealestate.com/. It ranks well on page 1 for the search term Montclair real estate. We created, helped write copy and optimized a number of additional web pages to help obtain this search position too. Jay – it might be a bit excessive. I would prefer my clients be guilty of having too many than not enough. How many websites do you see with zero embedded links to internal pages. More than there should be! So on that site, is her blog separate or did you integrate it into her site? Can we do that with mine? If you can integrate my tiger site for the IDX search I am ready to go. Then I could drop Number 1 and point my seasoned domain, Missy Caulk to the new Dakno swift site. Should there be more space between the paragraphs? Hi Missy – the Montclair blog is a separate URL from the website although we intentionally designed it to look like her website. We always (for the most part) recommend your brand be consistent from website to blog that way you are building trust with your target audience with repeated brand impressions. We are happy to discuss your blog/website options. Hi Jay – On the website? I think the separation and styling between paragraphs on the website is fine. Do you feel differently?